CHESHIRE, Conn. & CAMBRIDGE, Mass. "Moderna’s strategy is to aggressively seek to commercialize its mRNA platform for patients in need"
CHESHIRE, Conn. & CAMBRIDGE, Mass.--(BUSINESS WIRE)--Alexion Pharmaceuticals, Inc. (Nasdaq:ALXN) and Moderna Therapeutics today announced an exclusive strategic agreement for the discovery and development of messenger RNA Therapeutics™ to treat rare diseases. Alexion is a global leader in the development and commercialization of breakthrough therapies for patients with severe and life-threatening rare diseases. 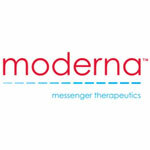 Moderna is a pioneer in developing messenger RNA (mRNA) Therapeutics™, a highly innovative treatment modality to enable the in vivo production of therapeutic proteins. Messenger RNA Therapeutics™ are designed to directly utilize the body’s natural processes to enable the in vivo production of both intracellular proteins, which remain within the cells, and secreted proteins, which are released into the bloodstream and act to restore function elsewhere in the body. As a result, the mRNA Therapeutics™ platform has the potential to speed the development and manufacture of treatments for many rare diseases that are currently untreatable with existing technologies. Under the agreement, Alexion will make an upfront payment to Moderna of $100 million to purchase 10 product options to develop and commercialize treatments for rare diseases with Moderna’s mRNA Therapeutics™ platform. Alexion will lead the discovery, development and commercialization of the treatments produced through this broad, long-term strategic agreement, while Moderna will retain responsibility for the design and manufacture of the messenger RNA against selected targets. Following option exercise by Alexion, Moderna will be entitled to drug development and commercial milestone payments, as well as high single to double digit royalties on commercial sales. In addition, Alexion has made a $25 million preferred equity investment into Moderna today. Alexion Pharmaceuticals, Inc. is a biopharmaceutical company focused on serving patients with severe and rare disorders through the innovation, development and commercialization of life-transforming therapeutic products. Alexion is the global leader in complement inhibition and has developed and markets Soliris® (eculizumab) as a treatment for patients with PNH and aHUS, two debilitating, ultra-rare and life-threatening disorders caused by chronic uncontrolled complement activation. Soliris is currently approved in nearly 50 countries for the treatment of PNH, and in the United States, European Union, Japan and other countries for the treatment of aHUS. Alexion is evaluating other potential indications for Soliris in additional severe and ultra-rare disorders beyond PNH and aHUS, and is developing other highly innovative biotechnology product candidates across multiple therapeutic areas. This press release and further information about Alexion Pharmaceuticals, Inc. can be found at: www.alexionpharma.com. This news release contains forward-looking statements, including statements related to anticipated target selection, drug discovery, clinical development, regulatory and commercial milestones resulting from the agreement between Alexion and Moderna. Forward-looking statements are subject to factors that may cause Alexion's results and plans to differ from those expected, including for example, outcomes of pre-clinical and clinical studies, success in manufacturing target products, decisions of regulatory authorities regarding marketing approvals, and a variety of other risks set forth from time to time in Alexion's filings with the Securities and Exchange Commission, including but not limited to the risks discussed in Alexion's Quarterly Report on Form 10-Q for the period ended September 30, 2013, and in Alexion's other filings with the Securities and Exchange Commission. Alexion does not intend to update any of these forward-looking statements to reflect events or circumstances after the date hereof, except when a duty arises under law.